10/Dec/2015 Posted By Barkat Dhillon no comments. Infrastructure as a Service (IAAS) is a form of cloud computing that provides virtualized computing resources over the internet. In an IAAS model, a third party provider hosts hardware, software, servers, storage and other infrastructure components on the behalf of its users. IAAS providers also host users’ applications and handle tasks including system maintenance backup and resiliency planning. IAAS platforms offer highly scalable resources that can be adjusted on-demand which makes it a well-suited for workloads that are temporary, experimental or change unexpectedly. Other characteristics of IAAS environments include the automation of administrative tasks, dynamic scaling, desktop virtualization and policy-based services. Other characteristics of IAAS include the automation of administrative tasks, dynamic scaling, desktop virtualization and policy-based services. Technically, the IaaS market has a relatively low barrier of entry, but it may require substantial financial investment in order to build and support the cloud infrastructure. Mature open-source cloud management frameworks like OpenStack are available to everyone and provide strong a software foundation for companies that want to build their private cloud or become a public cloud provider. There are two major network services offered by public cloud service providers: load balancing and DNS (domain name systems). Load balancing provides a single point of access to multiple servers that run behind it. A load balancer is a network device that distributes network traffic among servers using specific load balancing algorithms. DNS is a hierarchical naming system for computers, or any other gaming devices that use IP addressing for network identification – a DNS system associates domain names with IP addresses. 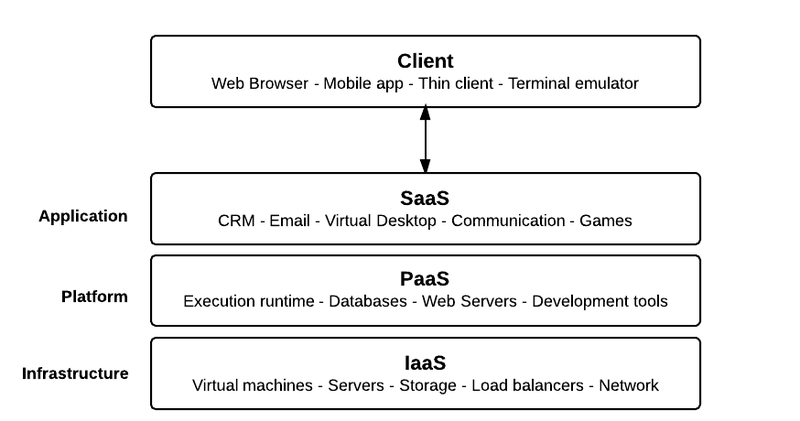 Platform as a Service (PAAS) is a cloud computing model that delivers applications over the internet. In a PAAS model, a cloud provider delivers hardware and software tolls, usually those needed for application development, to its users as a service. A PAAS provider hosts the hardware and software on its own infrastructure. As a result, PAAS frees users from having to install in-house hardware and software to develop or run a new application. PAAS doesn’t replace a business' entire infrastructure but instead, a business relies on PAAS providers for key services, such as Java development or application hosting. A PAAS provider, however, supports all the underlying computing and software; users only need to log in and start using the platform-usually through a Web browser interface. PAAS providers then charge for that access on a per-user basis or on monthly basis. Scalability and auto-provisioning of the underlying infrastructure. Build and deployment tools for rapid application management and deployment. Integration with other infrastructure components such as web services, databases, and LDAP. Multi-tenancy, platform service that can be used by many concurrent users. Logging, reporting, and code instrumentation. Software as a Service(SAAS) is a software distribution model in which applications are hosted by a vendor or service provider and made available to customers over a network, typically the Internet. SAAS has become an increasingly prevalent delivery model as underlying technologies that support Web services and service-oriented architecture (SOA) mature and new development approaches, such as Ajax, become popular. SAAS is closely related to the ASP (Application service provider) and on-demand computing software delivery models. IDC identifies two slightly different delivery models for SAAS namely the hosted application model and the software development model. automatic updates and patch management. easier collaboration, for the same reason. Storage as a Service is a business model in which a large company rents space in their storage infrastructure to a smaller company or individual. The economy of scale in the service provider's infrastructure theoretically allows them to provide storage much more cost-effectively than most individuals or corporations can provide their own storage when the total cost of ownership is considered. Storage as a Service is generally seen as a good alternative for a small or mid-sized business that lacks the capital budget and/or technical personnel to implement and maintain their own storage infrastructure. Communications as a Service (CAAS) is an outsourced enterprise communications solution that can be leased from a single vendor. Such communications can include voice over IP (VoIP or Internet telephony), instant messaging (IM), collaboration and video conference applications using fixed and mobile devices. The CAAS vendor is responsible for all hardware and software management and offers guaranteed Quality of Service (QoS). CAAS allows businesses to selectively deploy communications devices and modes on a pay-as-you-go, as-needed basis. Network as a Service (NAAS), a framework that integrates current cloud computing offerings with direct, yet secure, client access to the network infrastructure. NAAS is a new cloud computing model in which the clients have access to additional computing resources collocated with switches and routers. NAAS can include flexible and extended Virtual Private Network (VPN), bandwidth on demand, custom routing, multicast protocols, security firewall, intrusion detection and prevention, Wide Area Network (WAN), content monitoring and filtering, and antivirus. Monitoring-as-a-service (MAAS) is a framework that facilitates the deployment of monitoring functionalities for various other services and applications within the cloud. The most common application for MAAS is online state monitoring, which continuously tracks certain states of applications, networks, systems, instances or any element that may be deployable within the cloud. MAAS makes it easier for users to deploy state monitoring at different levels of Cloud services. Cloud Computing is a disruptive methodology that is rapidly changing how computing is done. When mass adoption of cloud computing services began in 2005 and 2006, several cloud migration service providers achieved an early market lead. Then the market started to boom around these cloud services, and many companies saw the potential and entered the market. Currently, although a few major players lead the market, none of them holds a market lock in terms of technology standards and features. There is still room for new emerging companies to make their mark in the cloud computing space.